Today I came across a music video by vocal artist Mark Masri. The title of the song is Joseph’s Song. This precious song is a very tender and beautiful reflection of what it must have been like to be the earthly father of Jesus. This song has become one of my very favorite Christmas songs. God chose Joseph ahead of time to become Jesus’ earthly father. 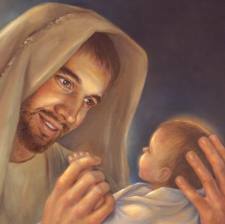 The writer of Joseph’s Song explores the thoughts and questions Joseph must have held soon after baby Jesus was born. What was it like for Joseph? As you listen to this song allow yourself to enter into Joseph’s world. Feel the conflicting emotions. As he held his newborn babe close to his heart, surely he remembered what the angel told him about this child.